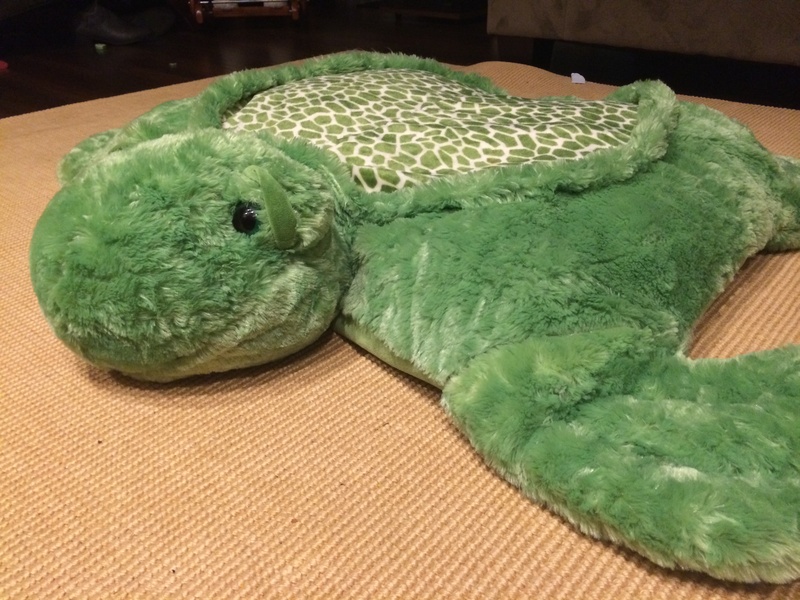 My husband and I bought a giant stuffed turtle for our daughter this past week. It’s kind of a mix of a blanket and a pillow, and a stuffed animal and it is incredibly soft. We brought it home and opened it up and laid it on the floor in our living room. She walked into the room and walked directly over to it like it had been there all along, and she crawled on top of it laying her face right in the middle, and then summoned us to join her. So there we lay on the turtle in the middle of the living room floor, all three of us with our heads side by side. After a few seconds went by she simply got up and directed us off the turtle and onto other activities. It was one of those moments as a parent of a toddler where a few things run through your mind consecutively; 1) Apparently she likes the turtle, 2) How precious that she wanted us all together on it, 3) It would be weird if someone walked into the room right now, 4) Why don’t we pause and do things like this more often? For those of you who are not parents, I ask for forgiveness for all the analogies and life lessons share that I am learning as a parent… But there are many and they are layered and they are mind blowingly life changing. What makes me write a blog entitled “giant turtle”? Well as I thought about what I could share with others about my angle on life, this giant turtle just kept staring at me (literally). And the reality is that everyday since we bought this turtle a week ago, she has done the very same thing, laying herself down on the middle and then beckoning anyone else in the room to join her for a brief pause…. So what started out as a fun animal for her playroom, became this family bonding, perspective giving turtle. Why is it perspective giving? Because it makes me wonder what’s so special about this object and what allows it to draw us together in a way that our couch does not. And I wonder what goes on in my daughters mind as she goes about this ritual each day. It makes me pause and be present, quite literally as I lay my head down beside hers and look over at her or up to the ceiling, I am nowhere else but right there on that turtle with my daughter. So why does this stand out to me? I suppose it’s because it is rare that I am present right here in this moment, and not drawn elsewhere in my thoughts. In our house it is also rare to lay still, we are not what you would term “laid back” kind of people. So what is my take away? What is the point of all this? I think it’s that we all need a giant turtle… or at least some equivalent of. We all need a space that we can pause in, and be present for ourselves and for one another, and we all need the ability to connect, even on the simplest level or form. I don’t know what your space might look like or what exactly will bring it about for you. But I’m encouraging each of us to create a space, however small, however unique. A space to pause, be present, be still and just BE. With the hope that this short pauses will bring meaning and purpose to all the other long and arduous ones! A dear friend of mine once sent me a card which pictured two little kids, backs against a wall, with facial expressions of fear, seemingly clinging for dear life and the caption read “some days are dodge ball days”. I have kept that card for many many years now and look to it often when I need a way to simply sit back and smile at what is outside of my control. This morning as I went for a run with my daughter, we paused at the duck pond to watch the mama and baby ducklings swimming in the pond, and they repeatedly were diving down into the water and then coming back up, and we watched as the water droplets simply rolled off their backs, leaving them with a dry appearance once more. I couldn’t help but think of the popular phrase “water off a ducks back’, and how many necessary moments there are in life to simply channel those little ducklings and let whatever it is just roll off, because the alternative is to become heavily weighted, carrying around more than necessary. So my question today; Is this a dodge ball kind of day? If so, how could you possibly channel those ducklings and let it roll off? We as a society have become so accustomed to struggling and fighting and working really hard at everything that we do, that we seem to be like a fish out of water if something comes easily or isn’t incredibly heavy to carry. As a result of the amount of time and energy we spend going strong and pushing hard, we have become an anxious, harried and “I’m so busy” kind of people. In my line of work, I see both the short term and long term ramifications of carrying these kinds of stressors throughout our lives. I see the toll that it takes not only on individuals, but also on families, and then in a larger context, on neighborhoods, communities and societies… We are exhausted. We are worried. We are stressed and we are tired. Often times this lends to a lack of patience, an inability to be in the present moment and a large ambivalence toward others and their own life experiences, because we are so caught up in surviving our own. So I am challenging myself and all of us today, to slow down. To breathe in a few deep breaths. To look around us at where we are and who is close to us and how we may have disengaged, and check in to see if we can re-engage, with life, with our families, and with our own sense of connectedness to the world at large.